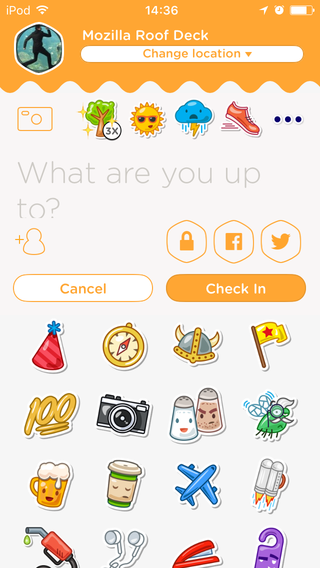 Swarm is a location app by Foursquare focused on checkins and showing nearby friends. Previously Swarm had been a mobile only app, with no interactivity on its website which was simply a splash page with links to the mobile apps. The link back provided was to the location (VenueURL) was on Foursquare's site. 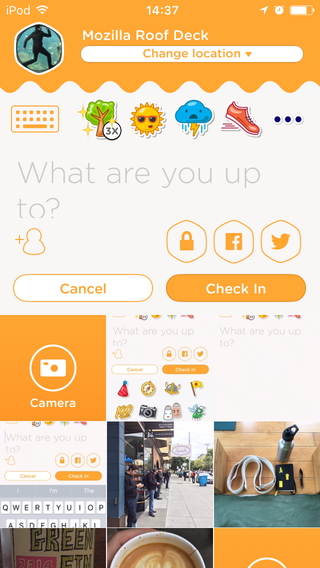 Currently (as of at least early 2017) their website can't be used for checkins, but now does allow login, viewing friend activity, viewing personal checkin history with Swarmapp permalinks (separate from the mirrored Foursquare permalinks which are also generated on their sister site), and a year in review. In general Swarm provides a very nice (reasonably fast & non-intrusive - see also Checkie - and convenient) mobile UI to post check-ins to your own site via OwnYourSwarm (see below for more on that). Since creating a similarly featured UI is non-trivial, and the OwnYourSwarm PESOS method seems to work well, it makes sense to just use it. Swarm's "reader" view also provide a nice summary of where your friends might be near you, perhaps a function that future indieweb readers could provide. 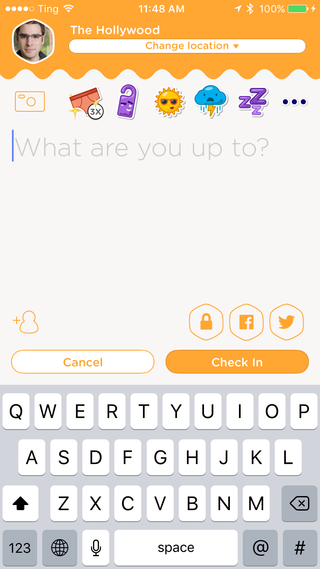 Known supports POSSEing checkins from your Known website to Swarm. Checking in using the Swarm application is easy, and provides a good user experience, especially with their new "offline checkin" feature. The app supports "share" options, which will create a post on various supported silos that have a permalink to your checkin. 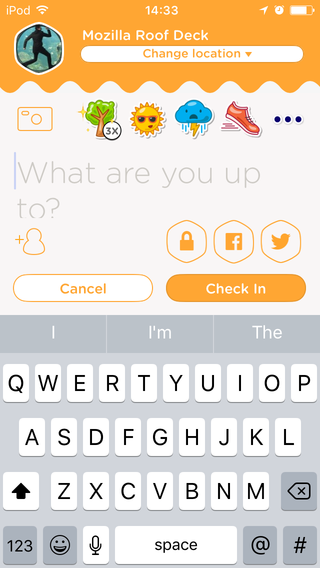 Swarm has an API to retrieve a user's checkins, along with photos and comments. There is also a realtime API which will proactively notify your server when a new checkin is created. OwnYourSwarm is a micropub client that will send your Swarm checkins to your website by sending a Micropub request. It also supports sending webmentions for coins, likes and comments on your checkins. 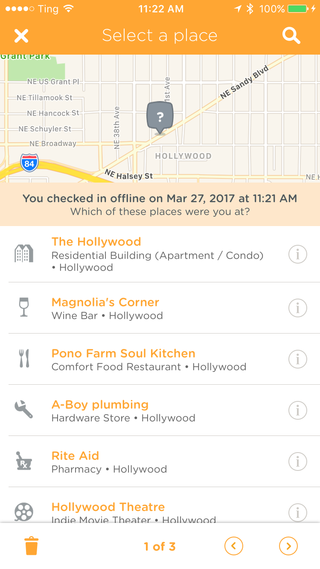 OwnYourCheckin is a micropub client based on OwnYourGram. This technically returns a Foursquare syndication URL instead of a Swarm specific one. Chris Aldrich has used OwnYourCheckin (since ~June 2016) in combination with the WordPress micropub plugin to own his checkins. 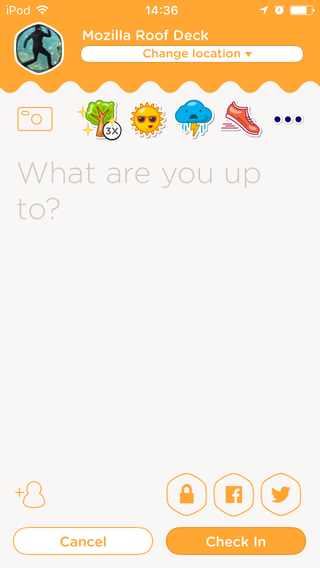 He occasionally manually inputs the syndication links from the Swarm app post as well as the FourSquare version. Example: http://boffosocko.com/2017/03/22/checkin-basin-141/ Since OwnYourCheckin returns the GPS data of the location, he also uses the Simple Location plugin to optionally display a map with the location as well. 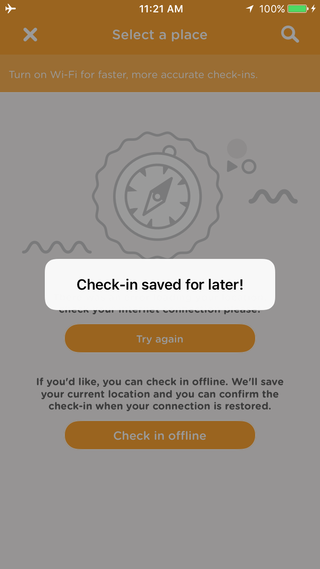 While one can upload as many as four photos to a checkin, OwnYourCheckin only allows the posting of one photo, the first one posted. 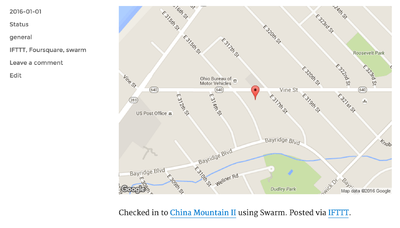 David Mead uses an IFTTT recipe for WordPress to watch his Swarm checkins, using the Foursquare channel. When a new entry appears it creates a post on his blog. You can find his recipe at https://ifttt.com/recipes/365678-post-swarm-check-in-s-to-your-wordpress-blog. Note: the IFTTT post formats plugin can be used to automatically set the post format (for example to "Status") using this set up. 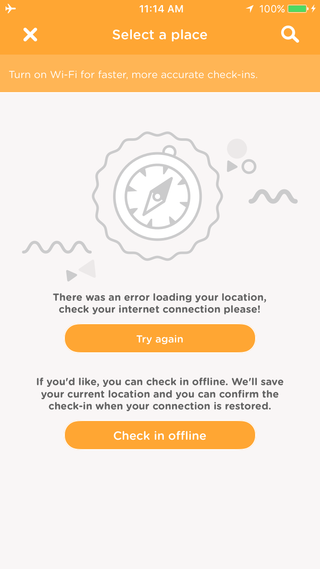 When there is no network connection, Swarm will prompt you to check in offline. Tapping the checkin button saves a bookmark of that location that can be used to create a full checkin later. 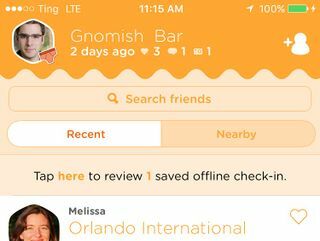 Once your network connection returns, you will see a notice on the main Swarm feed saying that there are offline checkins to review. Tapping that will reveal an interface for reviewing the one or more locations you previously saved. In between selecting the place and confirming, you are given the opportunity to add a comment or photo to your checkin like in the normal checkin workflow. 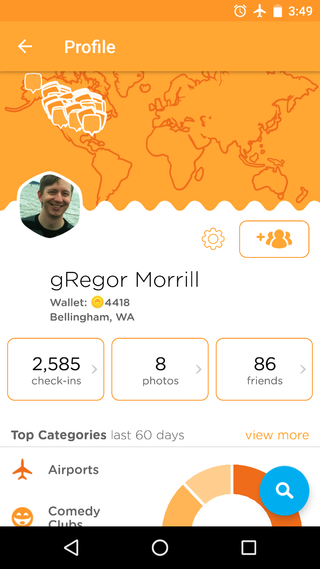 World map at top of profile shows your clustered checkins. 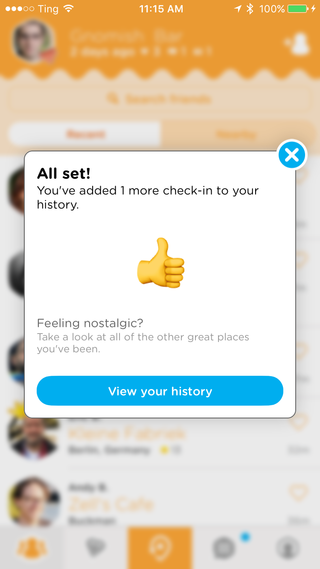 2015-03-25 Kevin Marks was shown an advertisement in his Swarm app: Note the first icon which is Tantek Çelik's icon on Foursquare (and thus Swarm), likely due to him having checked into CVS: "have been here". 2014-05-14 Swarm is ready for you! Download it now. This page was last edited on 20 February 2019, at 12:06.